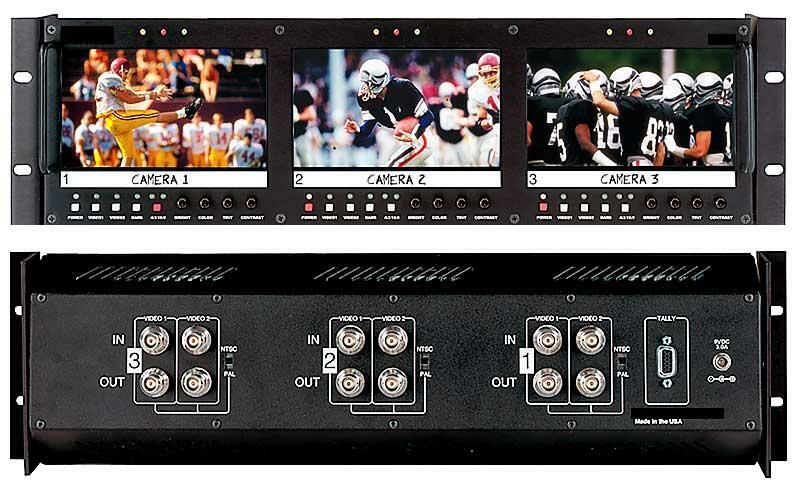 The LCDR3U5.8-01 is a rack mountable unit that has three independently controlled 5.8" active matrix LCD panels with active loop through feature. These 16:9 high-resolution panels have a pixel count of 1200 x 234, and are rated at a very bright 350 candle luminance. Each of the three screens has a built-in color bar generator, controls for brightness, color, tint, contrast, and selectable aspect ratio of 16:9 or 4:3. 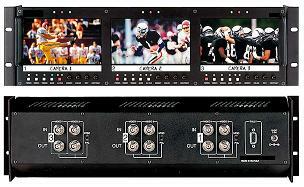 Each panel accepts dual composite video inputs, and has a selectable NTSC/PAL switch on the back. A built in 3 color tally system is also provided for each screen. The unit includes power supply, manual and fits into any standard EIA 19" rack, at only 3U high.